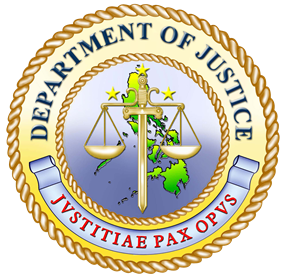 The Philippine Department of Justice (Filipino: Kagawaran ng Katarungan, abbreviated as DOJ) is the executive department of the Philippine government responsible for upholding the rule of law in the Philippines. It is the government's principal law agency, serving as its legal counsel and prosecution arm. It has its headquarters at the DOJ Building in Padre Faura Street, Ermita, Manila. The department is led by the Secretary of Justice, nominated by the President of the Philippines and confirmed by the Commission on Appointments. The Secretary is a member of the Cabinet. The current Secretary of Justice is Leila de Lima. The DOJ traces its beginnings at the Revolutionary Assembly in Naic, Cavite on April 17, 1897. The Department of Grace and Justice was tasked with the establishment of a regime of law in the Republic, with Severino de las Alas at the helm. The department, however, was not included in Pres. Aguinaldo's Biak-na-Bato Cabinet, which was established in November 1897. Shortly after the proclamation of independence on June 12, 1898, President Emilio Aguinaldo resurrected the department as the Department of Justice via a September 26, 1898 decree. The department, however, disappeared again in Pres. Aguinaldo's Cabinet upon the proclamation of the First Republic in 1899. After the American occupation a year later, the military government established the Office of the Attorney of the Supreme Court. On June 11, 1901, it was renamed the Office of the Attorney General and on September 1 of the same year, the office became the Department of Finance and Justice. In 1916, the department became a separate entity (once again the Department of Justice) by virtue of the Jones Law, and was given executive supervision over all courts of first instance and other inferior courts. Under the Japanese occupation, the department became the Commission of Justice, and later the Ministry of Justice upon the proclamation of the Second Philippine Republic in 1943. After the country's liberation from the Japanese forces near the end of World War II, the restored Commonwealth government re-activated the Department. It became the Ministry of Justice once more in 1973 during Martial Law, continuing in that form until 1987, when the return to a presidential form of government as mandated by the 1987 Constitution transformed all ministries back to departments. At present, the Department is headed by the Secretary of Justice, with three undersecretaries and two assistant secretaries. Prosecutors are assigned to each of the regions, provinces, and cities of the Philippines. ^ "GAA2014". DBM. Retrieved 23 January 2014. ^ "Department of Justice - Vision, Mission and Mandate". Retrieved 11 January 2013. ^ a b "History of the Department of Justice". Retrieved 11 January 2013. ^ "Today in Philippine History, September 26, 1898, Araneta and Buencamino were appointed to the Aguinaldo cabinet". The Kahimyang Project. Retrieved 11 January 2013. ^ "Republic Act 10071". Retrieved 11 January 2013.